The T-bone is an expensive cut of meat that's taken from the front of the short loin of a side of beef. This type of steak combines two of the most popular cuts of beef and takes its name from the T-shaped bone in its center. The meat on one side of the bone is a strip steak while the meat on the other side of the bone is a tenderloin. Though T-bone steaks are usually grilled or broiled, they produce juicy, fork-tender meat when cooked in a Crock-Pot, or slow cooker. Heat a skillet over medium-high heat for five minutes. Trim any visible fat from the edges of the T-bone, using with a sharp knife; this is particularly important if saturated fat is a concern. Drizzle 2 tbsp. extra virgin olive oil into the hot skillet. Add 3 cloves or 3 tsp. minced garlic and 1/2 tsp. fresh ground pepper. Swirl the garlic and pepper into the hot olive oil. Brown the steak in the preheated skillet for two to three minutes per side to lock in its natural juices. Transfer the seared T-bone to a cutting board or plate, using tongs. Add 1 cup sliced mushrooms to the skillet and saute them for one to two minutes. Spoon half of the sauteed mushrooms into the bottom of the slow cooker. Place the steak on top of the mushrooms. Pour the rest of the mushrooms, as well as any olive oil, seasonings or cooking juices left in the skillet, over the T-bone. Add 1/4 cup water or beef broth; use low-sodium broth if sodium intake is a concern. Cook the T-bone on the slow cooker's low heat setting for seven to eight hours or until fork tender. Check the steak two to three times during the cooking process, adding more water or broth if necessary; there should be approximately 1/4 cup liquid in the slow cooker at all times. Saute 1 cup sliced onions with the mushrooms, if desired. Salt the T-bone just before serving to ensure that it retains its natural moisture. 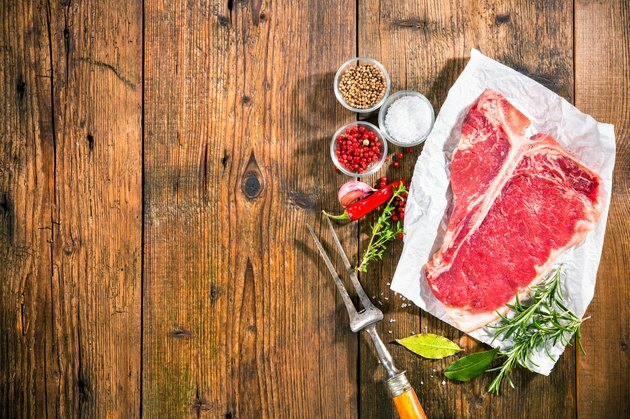 Salting the steak while it's cooking can cause the steak to dry out.